Last week, DogTime.com reported on the Boggs Mountain Humane Shelter, and a “Lucky Dog and Kitty” program. Under the program, for a fee, dogs and cats sent to the shelter would not be euthanized. 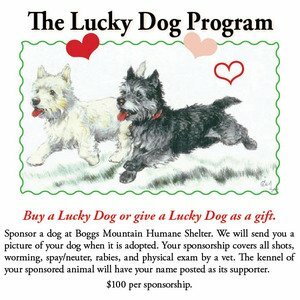 A promotion for the “Lucky Dog” program at the Boggs Mountain Humane Shelter in Tiger, Georgia. A whistleblower at the shelter claims the program was a fraud. Thanks to Fox 5 Atlanta I-Team reporter Randy Travis, facts have come to light about the “no-kill” shelter — specifically, the director, Lowanda “Peanut” Kilby. Twelve years ago, Kilby was charged with animal cruelty after she shot a hunting dog that walked onto her property. Although she was arrested, a grand jury decided not to prosecute. Kilby was also charged by the county tax office and local merchants with writing bad checks totaling more than $11,000; the charges were dropped after she eventually made good on the owed amounts. After Travis’ story broke, “Lucky Dog and Kitty” donors across the country have voiced concern of animals they thought were spared euthanasia under the program. A Facebook page, “Lost Dogs of Bogs,” was established to track the animals. The Board of Boggs Mountain Humane Shelter fired Kilby on July 26 by unanimous vote. The Board also accepted the voluntary resignation of Chair Penny Burkitt. The actions were announced in a press release issued the following day.